Young people with Type 2 diabetes are developing complications such as kidney, nerve, and eye disease more often than those with Type 1 diabetes in the years soon after being diagnosed, according to new research funded by the National Institutes of Health (NIH) and Centers for Disease Control and Prevention (CDC). An estimated 29.1 million people in the United States are living with diabetes, with an estimated 5,000 Americans under the age of 20 receiving a Type 2 diagnosis each year. Type 2 diabetes is a condition characterized by insulin resistance (in which the cells do not use insulin efficiently) and insufficient insulin secretion by the pancreas. In past years, Type 2 was thought to affect only adults, but in the 1990s, endocrinologists began to see the condition in children, and more recently, rates have been surging in those under 20. To determine the prevalence of diabetes complications in young people diagnosed with Type 1 diabetes or Type 2 diabetes as children, researchers looked at 1,176 youth with Type 1 and 272 youth with Type 2 as part of the SEARCH for Diabetes in Youth study, the largest study of its kind in the United States. The participants were, on average, about 18 years old and had all been diagnosed before age 20. 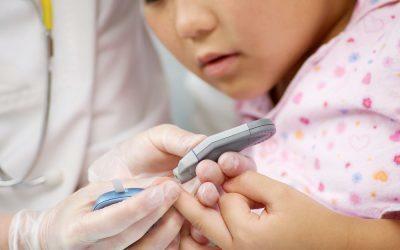 The researchers found that by age 21, roughly one-third of those with Type 1 and three-quarters of those with Type 2 had or were at high risk for at least one diabetes complication. By the end of the study, of those with Type 2 diabetes, nearly 20% developed a sign of kidney disease, roughly 18% developed nerve disease, and about 9% developed eye disease. Of those with Type 1 diabetes, roughly 6% developed a sign of kidney disease, approximately 9% developed nerve disease, and about 6% developed eye disease. High blood pressure and arterial stiffness, risk factors for heart disease, were greater in youth with Type 2, but cardiovascular autonomic neuropathy, another heart disease risk factor, was about equal in both groups. Even after taking a number of factors into account, including blood sugar control, body-mass index (a measure of weight relative to height), waist-to-height ratio, and blood pressure, the researchers could not explain why youth with Type 2 diabetes developed more complications than those with Type 1 diabetes. However, “The one big difference in the kids with Type 1 and Type 2 was obesity. When we controlled the data for obesity, there was no longer an excess of complications for Type 2 diabetes,” said lead study author Dana Dabelea, MD, PhD. Other factors may also help explain the differences between the two groups, including that Type 2 diabetes may be more aggressive in children, the limited number of treatment options available for Type 2 in children, and the relative diversity of the Type 2 group (meaning those with Type 2 may have come from poorer homes with less access to health care than those with Type 1). For more information, see the NIH press release “Youth With Type 2 Diabetes Develop Complications More Often Than Type 1 Peers” or the study’s abstract in The Journal of the American Medical Association. And to learn more about children and Type 2 diabetes, read “Kids Get Type 2, Too” by certified diabetes educator Amy Campbell. If you live in the Boston area and have a child with Type 1 diabetes, you may be interested in the upcoming “Teddy Bear Clinic,” hosted by Joslin Diabetes Center. Bookmark DiabetesSelfManagement.com and tune in tomorrow to learn more.